1 of 7 Have the cake balls chilled and in the refrigerator. 3 of 7 When you are ready to dip, remove a few cake balls from the refrigerator at a time. 4 of 7 One at a time, dip about 1/2 inch of the tip of a lollipop stick into the melted candy coating, and insert the stick straight into a cake ball, pushing it no more than halfway through. Dip the cake pop into the melted coating, and tap off any excess coating: Hold the pop over the bowl in one hand, and tap your wrist gently with your other hand. 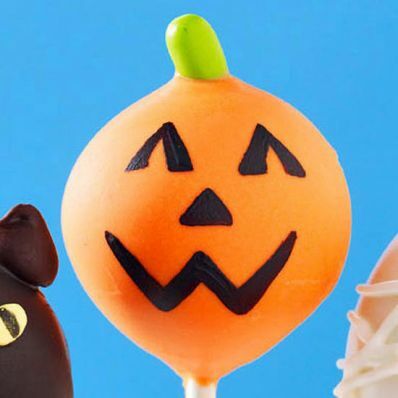 5 of 7 (If you use the hand holding the cake pop to shake off excess coating, the force of the movement will be too strong and could cause the cake ball to loosen or fly off the lollipop stick.) The excess coating will fall off, but you will need to rotate the lollipop stick so the coating doesn't build up on one side, making it too heavy on that side. If too much coating starts to build up at the base of the stick, simply use your finger to wipe it off, spinning the lollipop stick at the same time. This can happen if the coating is too thin or too hot. It's not as hard as it sounds; it just takes a little practice. 6 of 7 Immediately insert a Tic Tac into the very top of the pumpkin pop. Hold in place until set, and let dry completely in the Styrofoam block. Repeat with the remaining pumpkins until they all have stems. 7 of 7 Add jack-o'-lantern faces with a black edible-ink pen, and let dry completely in the Styrofoam block.